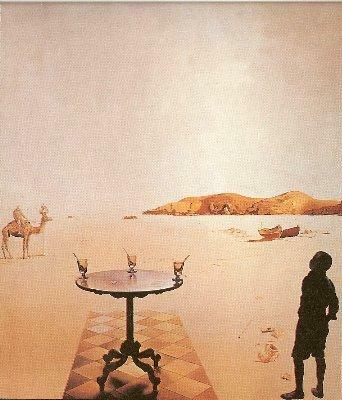 Biography: Dali was born in Catalonia and entered the School of Fine Arts in Madrid in 1929. He was eccentric, but also a methodical worker; he would visit the Prado every day to copy painting of different schools. He exhibited at the Dalmau Gallery in Barcelona in 1925. Dali's first surrealist work was the scenario for the film Un Chien andalou (1928), by Luis Bunuel. Miro introduced him into the surrealist group and in 1929, he exhibited in the Galerie Gocmans in Paris. He portrayed his skillfulness in the use of the double image technique in the Metamorphosis of Narcissus (1937). In 1939, Dali came to the United States, and lived at Del Monte, near Hollywood. In the year between 1949 and 1950, he began his "mystical period," but still like to maintain that he was indeed still surrealist. This period ended with the "nuclear period," which included Exploded Raphaelesque Head (1951). He then returned to Catalonia, where he remained primarily a recluse, except for a few attempts at artistic display, which were said to mask his true talents as a painter.